This page is for anyone looking for a bicycle-friendly route between Chicago and Nashville- Terre Haute, IN, Evansville, IN, Vincinnes, IN, Clarksville, TN. A couple friends and I took this route in June 2009. We left the 95th St Red Line Train station in Chicago on Sunday at 2 pm and arrived in Nashville, at Centennial Park, on Saturday at 3pm. Our pace was somewhat leisurely, traveling 47 to 108 miles per day. So here is our tried-and-true route if you're interested. I'd say it worked quite well. If you're starting in Chicago, you first have to get through northern Indiana. I've spelled out a good route here for you so you can avoid the obnoxious suburban mega-avenue that is Indianapolis Blvd. You'll use a combination of side streets and bike paths that will get you through while adding only a mile or so. This route reunites with US-41 at Schneider, IN. Here, US-41 and its counterpart, SR-63 is a divided highway, shoulder is minimal for a few miles but after that, the shoulder on the rest of this route is generously paved all the way to the Indiana/Kentucky line. I've mapped this route on bikely. There is also a cue sheet saved in there and here for your reference. Along the shores of Lake Michigan, there is an beautiful path running nearly the entire length of the city. We've already seen the lakefront many times, so we chose to use the CTA Red Line train to reach the south end of the city. From the train station, we traveled 95th street to reach the lakefront. 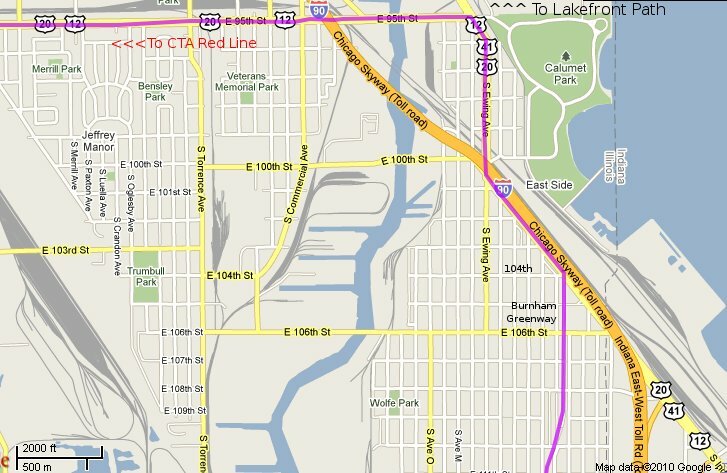 We then took US-41, which at this point is a typical Chicago secondary thoroughfare, suitable for biking. Upon crossing the skyway (I-90), there is a paved bike path that follows Indianapolis Boulevard/US-41 for a bit, then it turns south and becomes the Burnham Greenway. The path turns south where 104th dead ends at Indianapolis Blvd., address approximately 10460 S Indianapolis Blvd. The path will take you through some neighborhoods, then into a nature preserve. You emerge into a park, then onto neighborhood streets, go east on 134th and take Hohman Ave, a quiet, secondary thoroughfare into Calumet City. In Calumet city, about a block east of Hohman & Sibley, there's another bike path. This path will take you several miles South East until it crosses under I-94 near US-41/SR-152. On the south side of I-94 there is a Cabela's store. Go west into the neighborhood there and use those streets to go south to Ridge, east on Ridge, then South on Kennedy. Kennedy is a quiet, secondary suburban road, great for biking. After a few miles, Kennedy appears to end at Junction Ave, but you can just walk straight south across the railroad tracks and resume southbound on Kennedy. It appears to end again at Joliet St. but you can just cut through the parking lots and cross US-30 Lincoln Hwy, and get right back on Kennedy. At this point you have a few miles of neighborhood streets to wind to make your way to 101st and Parrish. Parrish is a paved semi-rural road and very pleasant for biking. Parrish will take you several miles south until it ends at 181st (SR-2). Just go east a block and take Austin St. Austin will take you a few miles until it curves back into the resurrected Parrish. Parrish will take you into Schneider and onto US-41. If you're looking to camp at this point, just south of Schneider, along the Kankakee river, just west of the highway is a nice, sandy spot that we enjoyed. Make sure to get your food for the night early- we were disappointed to find the store and restaurant in Schneider closed for the night. A few miles south of Schneider we found a decent roadside diner. We loaded up on pancakes and coffee, and hit the highway. This stretch eases into farmland and windmills. There will be some sort of establishment every 10 miles or so for food/water. There are a few towns big enough for a supermarket, Morocco is easy to pull into and return to the highway, as is Kentland. If you want to cruise through Kentland, you can get onto "S 250 W" as you cross "W 1400 S". "250 w" parallels US-41, and takes you right into Kentland; there is a full-service supermarket there- after your shopping trip just go a few blocks east and you're back on the highway. We were finishing up for the day when we came across Carbondale, IN. We pulled off the highway and into this town that was nothing more than a few houses, cemetery, and bar. The bar proprietor was friendly and cooked us up a frozen pizza for $5. After exiting Carbondale, we got onto SR-63 headed towards Terre Haute. Both US-41 and SR-63 will take you to Terre Haute- 63 is a divided highway with a paved shoulder and 5 miles shorter than 41. The folks at the bar recommended an overgrown roadside park down the highway. We camped the night there, worked well enough. The spot is on SR-28, about a half mile east of SR-63, on the south side of the road. If you go here, watch out for poison ivy. The day started with rain. The highway was rolling hills that eased up as we approached Terre Haute. Terre Haute is known for its college and Sony's manufacturing plant. Anyone who subscribed to "Columbia House" music mail order service that was popular in the 90s may remember sending letters to Indiana's 5th largest city. (Columbia House was famous for their "8 CDs for the price of 1" offer often advertised in magazines) We could've gone farther but we were ready for dry clothes, a shower and a swim. Anything you want or need at this point, you can get it in Terre Haute. When you come into town, take the Maple Ave (Grand Ave) turn off- this puts you on a side street parallel to US-41, after a few blocks you can cut over to the east on Maiden Ave to take 4th street south. It goes through town and parallels US-41. In the heart of town there are several hotels & motels you can snag. Don't be afraid to haggle on room prices, chances are there are plenty of empty rooms in this town. A good route out of T.H. is 7th street. It will put you back on US-41 at the south end of the city. US-41 is more rolling hills, passing through what seemed to be watermelon country. It inspired a sing along of the popular country song "Watermelon Crawl" If you drink don't drive, do the watermelon crawl! This is when we really started to catch up with the heat, and after 55 miles Vincinnes made for a great few hours in the shade until the heat let up. The approach into Vincinnes felt like a freeway, but we never saw any signs saying motor vehicles only, and the generously paved shoulder felt nice and safe. Just stay straight into SR-61, it'll dump you right into Vincinnes' Franchise Ghetto. If you don't like cruising down Franchise Mega-Avenue, take a right and head over to 2nd street for a parallel route. Neighborhood streets take you through the rest of vincinnes, then you're back on US-41. It's another 45 or so miles until you hit the fringe of Evansville, which is the third largest city in Indiana. We spent the night at the Drury Inn on the north edge of town. The hotel is a great value- the rooms are really nice, there's an indoor pool and free hot breakfast. I can't vouch for the stretch of US-41 through Evansville because we had to make a detour to a bike shop on the east side. Once you're on the south side of the Evansville (Indiana's third largest city and also home of musician John Mellencamp), you cross over the river into Kentucky. This bridge is the most unpleasant road conditions on the whole trip. But there doesn't seem to be an alternative nearby, and it isn't TOO bad... Just don't ride too close to the drains on the bridge, you'll probably biff it! After the bridge, US-41 is a shoulder-less, sidewalk-less mega-avenue. So as soon as you cross the bridge, take the first turn-off on the right. I think there's a motel there. You can work your way through the side streets in Hendersonville to get back to US-41. This is where you need to check your maps. We took US-41A. The scenery was nice on 41a, but it is hilly and 10 miles longer than if you take the regular 41. 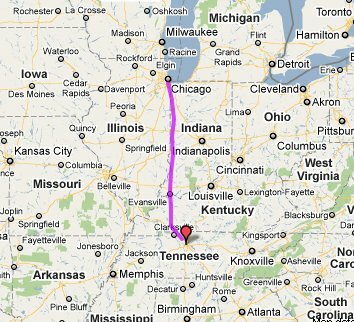 Also, we found our map a bit confusing here- US-41 parallels the Pennyrile Parkway through a lot of kentucky. Pennyrile is a freeway, and us-41 is a local road. 41 and 41a come back together in Madisonville. We found a couple hotels and a Kroger supermarket on Nebo/Island Ford/SR-281, just east of the Pennyrile, and spent the night here. Day 6 was a pleasant stretch of 41, hitting a few towns occasionally, and some beautiful vistas as we worked our way through the hills of Kentucky. It was quite hot on this day, and we stopped in Hopkinsville for several hours to relax in the shade of the park, have lunch, and spend another hour or so dealing with a stubborn flat tire. Check your maps again on the way out of Hopkinsville, we found ourselves about a mile off our route as we left town. US-41 is pretty much shoulder-less as you leave Kentucky. The road is level and minimal curves so you'll be visible to approaching traffic. 41 becomes a surburban mega-avenue as you approach the army base at clarksville. There's several lanes though, and the speed limit is low enough that it felt ok. We took over a lane to avoid the pass-at-point-blank assholes, and as soon as we got to Ringgold Rd (burger king?) we were able to make a left and get through this part of clarksville on side streets. Our side street route reunites with US-41 at the cumberland river. The crossing was quick and we ducked into a shopping center and made our way onto riverside drive. This is where downtown clarksville begins, they have a lovely riverwalk where we relaxed before getting a room downtown. The final stretch to Nashville was quite pleasant, aside from another day of hot weather. We used side roads to get through the rest of clarksville and back onto US-41 (Madison St). We then took US-41a out to Nashville. 41a here is a rural road which we found very pleasant for biking. Rolling hills reveal beautiful vistas, and all the uphill pays off about 10-15 miles out of Nashville- check your brakes! Our route ended at Centennial Park in Nashville where we enjoyed some rest and delicious BBQ pork at Hog Heaven.